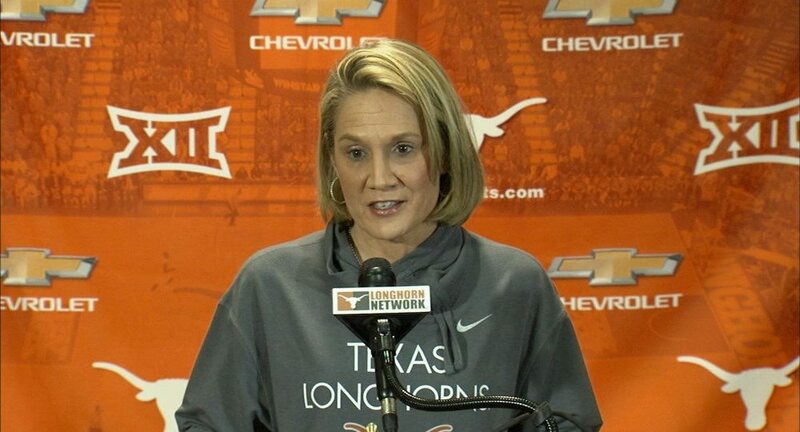 Women's basketball head coach Karen Aston will guide the Longhorns through a non-conference schedule feature six teams that made it to the Sweet 16 in last year's NCAA Tournament (photo courtesy of texassports.com). AUSTIN, Texas — Six teams that reached the Sweet 16 in last year’s NCAA Tournament, including national champion Connecticut, will be among the teams to face the University of Texas women’s basketball team during the non-conference part of the Longhorns’ schedule. Seven of UT’s 12 non-conference games will be played at the Frank Erwin Center, which also will be the site of an exhibition game against Tarleton State. Among those who will visit Austin are national heavyweights South Carolina and Tennessee. Those two schools are among six non-conference opponents listed in ESPN’s “Way Too Early Top-25 Poll.” South Carolina is ranked third, Connecticut fourth, Stanford 10th, Tennessee 11th, Mississippi State 12th and Florida State 15th. The Texas schedule has been ranked among the nation’s top 20 in each of the last three seasons. This year’s non-conference opponents had a combined record of 229-119 (.658) last season; six of Texas’ 11 non-league foes finished with an RPI in the top 21 a year ago. "We are looking forward to another challenging schedule and our players really embrace competition against some of the best teams in the nation," head coach Karen Aston said. "This year's schedule offers us a good balance that features our traditional rivalries and a good mix of national contenders and opponents from within the state of Texas. Our strong non-conference schedules over the past several years have really given us great opportunities to asses the strengths and weaknesses of our team and gain some early confidence. This year's schedule is no different, and will again prepare us well for the Big 12 Conference schedule and the NCAA Tournament."